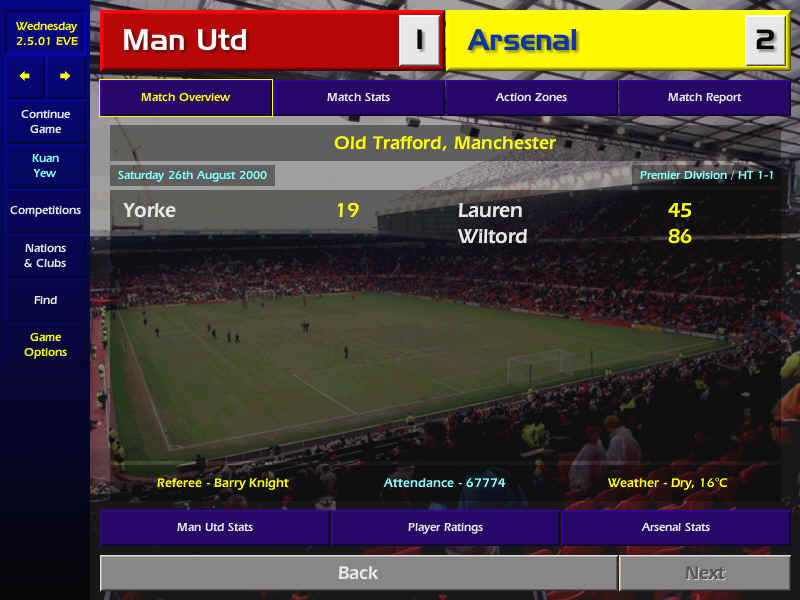 The season's fixture list came out and I saw that I had a tough opening day schedule at home to Liverpool. This was to be followed by Leicester before facing the mighty Manchester United at Old Trafford. The scouts came back with glowing reports, which led to the purchase of Micheal Clegg, Alan Quinn, Alex Notman and Steve Simonsen. I also secured Rio Ferdinand for £9 million. I also tabled a bid for Javier Saviola (River Plate) and Joe Cole (West Ham). I offloaded a few more players just to make way for my new players including Rohan Ricketts, Jerome Thomas and Greg Oates. All eyes were on me as Arsenal entertained Liverpool. All my pre-season training and tactics will be put through the acid test. After the match, Houllier came over and shook hands. I was so proud of my team that I stood on the pitch and soaked in the cheers for a full 10 minutes before making my way to the exit. A 2-1 win over Leicester made sure that we were still at the top of the league when we face arch rivals and defending champions Manchester United. I knew that a comfortable win here would signal the dawn of a new era. From the way we outclassed the Red Devils. It rekindled the 1998 championship-winning spirit in the squad. We were drawn with Monaco, Inter Milan and Herfolge for our Phase 1 Champions' League group matches. On paper it seemed like a tough group as Monaco and Inter Milan were no pushovers. I promised the Highbury faithful that Arsenal will qualify for the second phase. 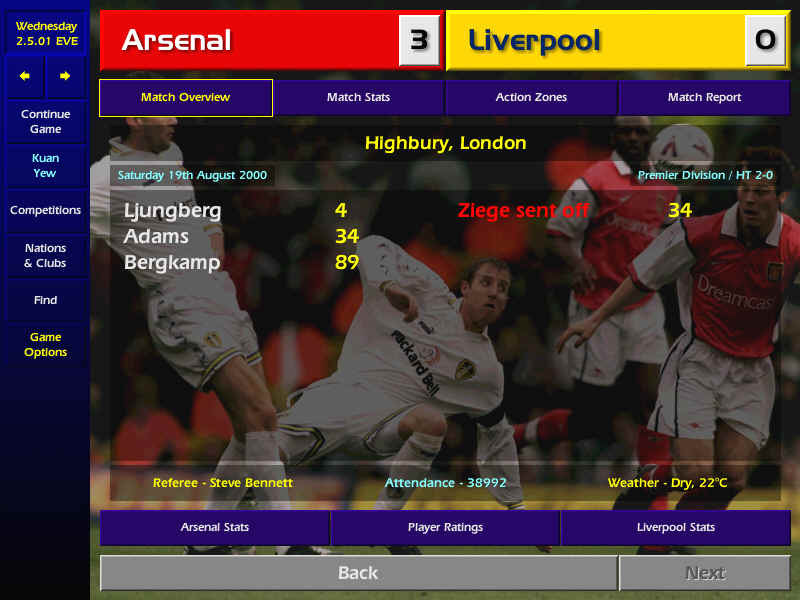 Things were looking great when we defeated Monaco (3-2), Inter Milan (2-1) and sent Herfolge packing with a 4-0 drubbing. With a quarter of the league gone, Arsenal sat comfortably on top of the league with 8 wins and a draw. The solitary hiccup came against Middlesbrough. At this time, I managed to sign Joe Cole for a whopping club record of £12 million and Jonathan Greening from Manchester United. This prompted Alex Ferguson to comment that I was prying his players away from him. A promising defender from Tranmere by the name of Clint Hill, promised to join when his current contract expires in June 2001. I had to sell off Ben Chorley and Nelson Vivas. Looks like the future is going to be red and white.